Although the vast majority of transactions carried out every day online are genuine, there is a growing number of criminals who seek out people’s identities in order to use them for their own advantage. Criminals who steal identities do so for a wide variety of reasons; from ‘hijacking’ someone’s good credit rating, to using the information to apply for passports, driving licences and in other full-scale international criminal organisations. What do you do with your old bank and credit card statements? Often people keep these ad infinitum because they don’t know what to do with them. 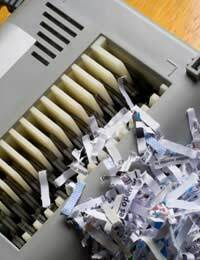 Others shred their statements and either throw them away or recycle the shredded paper. You should be cautious about doing this, however: it is not unknown for criminals painstakingly to put old bank or credit card statements back together if they are able to retrieve them from your rubbish or recycling bin. The best option would be to burn your statements once you are sure you don’t need them anymore. If this isn’t practical, shred them but make sure that you distribute the shreds amongst several batches of other shredded paper. That way it will be much harder for the information to get into the wrong hands. Have you ever given out your personal details over the phone when someone rings up purporting to be from a bank or other financial institution? There have been several incidents in the news recently about lost laptops, missing USB keys and other data storage items that have been stolen that contained personal or sensitive details about people. Sometimes, these lists get into the wrong hands and you may receive a telephone call from someone purporting to be from your bank, or have won an instant cash prize. NEVER give out information before the person on the other end of the phone has verified who they are. It is not sufficient for someone to be able to tell you your own name, address, or postcode. If it really is your bank, for example, they will know things like: the direct debits that come out of your account; the date of your last statement; how much money you normally pay into your account on a monthly basis. If in doubt, hang up! Do you use MySpace, Facebook, Twitter, or Bebo? If you do, make sure you don’t give away too much information about yourself. Fraudsters can monitor these sites and piece together the data that you post in order to get a good picture of who you are and other information about you. Do You Have A Spam Filter On Your Email? If you commonly receive unwanted and unsolicited email from unknown sources, such as for ‘herbal viagra’, online pharmacies, or offering cheap computer software, CDs, DVDs etc, you are receiving spam. If you do receive these kinds of emails, it doesn’t necessarily mean your identity has been compromised- so don’t panic. Spammers use software to ‘guess’ people’s email addresses, and if your email address is visible anywhere online, they can use software to ‘harvest’ addresses that way. Often these emails can contain viruses and may propagate online fraud, so you’re better off using a spam filter. If your email doesn’t allow to you filter spam, set up a new one that does – Google Mail, Yahoo Mail and Hotmail all offer spam filters. Do You Have A Good Web Browser? Are You Signed Up with A Credit Watch Company For Credit Alerts? Although these can cost around £8 per month, if your budget allows they can give you peace of mind in terms of identity theft. Whenever there is a change to your credit rating, you will receive an ‘Alert’, either by text or email. Once you have logged in to your member area on the website, you can find out exactly what has changed on your credit file. Often ‘alerts’ will simply be deleted searches, updates to your information such as the electoral roll, but if someone tries to apply for credit in your name without your authorization you will know. If you have been burgled, was any documentation stolen? It is easy for criminals to piece together information if they have sufficient documentation to do so. As a result, it’s always a good idea to ensure that your bank statements, credit card statements, mortgage statements and any other important documents are kept in a file, rather than leaving them scattered around the house or on display where they can easily be taken. Do You Live In A Property Where There Is Shared Access To Mail? If you have a communal entrance area in your property, it is wise to take all the mail that arrives in both your own name and the names of the people who used to live in your property. You do not want mail destined for an ex-resident getting into the wrong hands. If you receive a lot of excess mail, simply ‘return to sender’ and the unwanted mail should soon stop. Do You Use Internet Cafes To Shop Online? It is never wise to enter your personal details and payment information on a public computer. You do not know whether anyone else would be able to retrieve that information later on, and you never know who is looking over your shoulder. Do You Use Different Passwords For All Your Online Transactions? People often complain about the large number of passwords and passcodes they are expected to remember nowadays. It is common for people to choose one or two words or dates of birth and use those as passwords for everything. This is ill-advised because if a criminal gets hold of your main password for one thing, they’re more likely to be able to guess the others. Although it can be difficult to remember so many different passwords, it’s best not to write them down. Some people disguise pin numbers and passcodes as telephone numbers in their address book, but you should always ensure that it’s not obvious to a criminal that this is what you’ve done.